Sunday morning after having landed in Rome’s Ciampino Airport the evening of Saturday, May 13, 2017, Pope Francis traveled to the Basilica of Santa Maria Maggiore to offer thanks for the success of his two-day Apostolic Pilgrimage to Fatima, for the Centenary of the Marian Apparitions. During his visit, he canonized the two little visionaries, Jacinta and Francisco Marto. According to a note from the Holy See Press Office, yesterday morning, which marked Mothers’ Day, the Holy Father made his usual detour to go to the Marian Basilica. 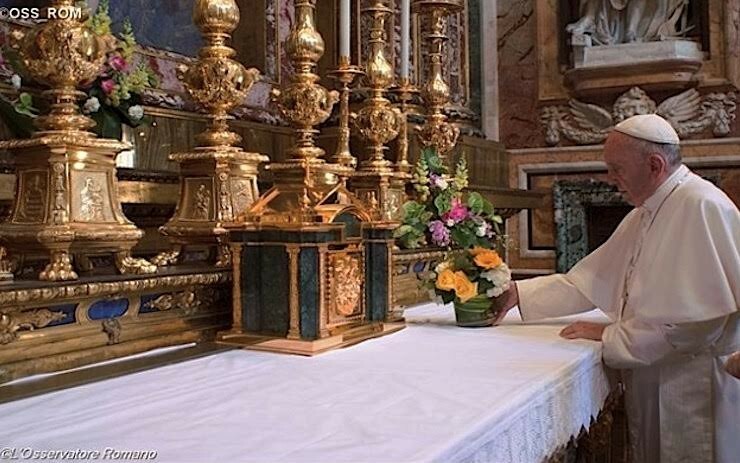 The Holy Father always venerates the icon before and after his international apostolic trips.